Shopping helper is a simple to use app with two sections. This first is your shopping list, you can add your list of items to the list before leaving the house and mark them as added to your basket as you put them in making sure you never forget anything. The second section is a calculator that make it easy for you to keep a running total of how much your shopping is going to cost. 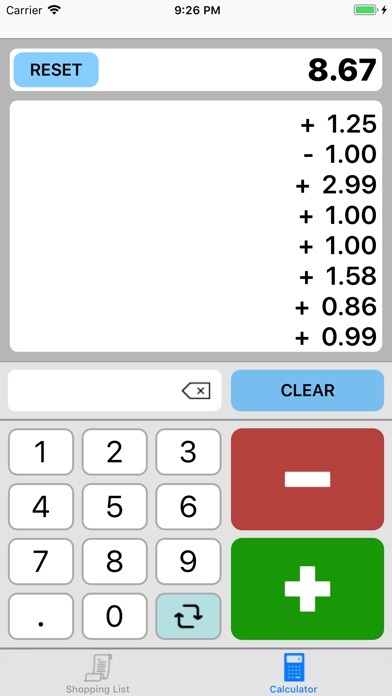 The calculator has a simple design with an add and remove button and keeps a running list of the items you have added (the cost). The app does not require an data to use so even when your in an area with not coverage you still have your list. Only thing missing is a save option. Some times I accidentally close the app and lose my total. Nice large plus and minus buttons, I can easily add multiple items of the same price and I can see the last several items I priced. Well done.